DESCRIPTION FROM THE PUBLISHER: If you were an astronaut traveling far out in space and you looked at the earth, what would you see? A small ball in the huge black universe. That’s where these pictures begin. Then they move closer and closer to the earth, each view revealing new details. Until finally… See for yourself. 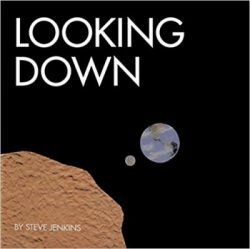 In this wordless picture book with stunning cut-paper illustrations, Steve Jenkins masterfully depicts the many levels of the universe, from the farthest reaches of space to the most familiar corner of your backyard.